Footrests are constructed from hard, extruded plastics and aluminium parts. They are simple to use and maintain. The smoothly gliding extrusion makes using the pedals simple, while the shallow trough in which the pedal slides allows dirt to be pushed out the end, so maintenance is easy. With no moving pins or buttons to corrode or clog in sand, one can adjust the footrest with ease, by simply putting light pressure on the pedal and with one hand lift the buckle tab slighty and push or pull the webbing tongue. With easy adjustment and confidence in the strong webbing, the footrest can be used for stearing or strong bracing. Designed for added adjustment and ease of footrest and rudder use, it can simply be used as a stopper to stop footrest pedal from falling out of the track when the pedals are not in use or as a one time adjustment to your personal footrest length (never adjust them again). 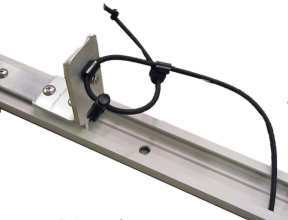 But it was also designed to be a self-centering device for your rudder. With footpedals properly adjusted you should always stay straight until directed otherwise by the foot peddles.